Located on the second floor of Del Mar Highlands Town Center, Mia Francesca and Davanti Enoteca each offer contemporary and creative takes on classic Italian dishes. With a culinary philosophy that embraces the use of seasonal, local ingredients, the sister restaurants have introduced a tasty lineup of warming autumn flavors to showcase Fall crops in a modern way. We recently visited the restaurant duo, and enjoyed some of their seasonal offerings that will certainly ease diners into the crisper weather. We started our dining experience with a delicious cocktail - Mia Francesca's creative take on a sparkling cider - combining apple cider, Prosecco, cinnamon, and Captain Morgan Spiced Rum served in a champagne flute. This festive reimagination of a classic holiday staple truly captured the essence of spiced sparkling cider. Our first course was Davanti Enoteca's shaved brussel sprouts with pecorino parmesan vinaigrette. This salad of shredded sprouts was enhanced by the pungent cheese, making for a very enjoyable starter. The next dish was roasted butternut squash with farro grain, goat cheese, hazelnuts and watercress from Davanti. The fresh flavors melded together for a very seasonal dish and a toothsome combination of textures. Davanti's last sampling was a deconstructed bacon wrapped scallop - a seared scallop perched atop crispy pork belly, with the proteins sitting on spaghetti squash tossed with pear bits. Spaghetti squash is the perfect fall ingredient, especially with Italian fare, and crispy pork belly always makes us happy. In preparation for the transition to Mia Francesca's offerings, we cleansed our palates with Davanti's Scotch Apple cocktail, a strong and gut warming beverage similar to an Old Fashioned, but with a lovely autumn twist. Davanti Enoteca takes Johnny Walker Red and infuses it with flavors of the season such as clove, cinnamon, nutmeg, apple, etc. and then lets it sit for 3-4 days until the flavors balance just right, then presents it on the rocks after lightly flaming an orange peel to get the oils out of the fruit before serving. Sample it at Davanti, then try to make it yourself for your own holiday party! Mia Francesca showcased her use of Fall's favorite ingredient with a pumpkin-filled ravioli served in a shallow bath of browned butter sauce and veal reduction, and garnished with fresh tomatoes and pasta. The pumpkin was velvety and the brown butter sauce was rich and flavorful. Next up was Mia Francesca's gnocchi bolognese, a pillowy potato pasta sauteed in tomato meat sauce with carrots, celery, onion and fresh herbs topped with parmigiano cheese. The pasta was light and fluffy and the sauce filled with authentic flavors. To finish our meal, we were presented with Mia Francesca's Mele e Mascarpone dessert - a layering of carmelized apples, mascarpone cheese and crumbled graham crackers. Similar to an Italian cheesecake, but served in a mini mason jar, this dish was creamy and sensual. 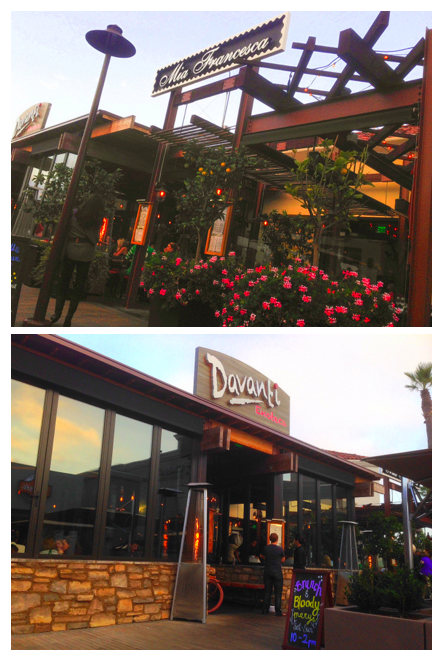 North San Diego County favorites Davanti Enoteca and Mia Francesca are located in Del Mar Highlands Shopping Center at 12955 El Camino Real, with the second Davanti Enoteca located in Little Italy at 1655 India Street. For more information, visit davantidelmar.com, davantisandiego.com, and miafrancesca.com.